GREEN BAY—Ted Thompson, the architect of the Packers’ current five-year playoff run, will remain the team’s executive vice president and general manager for the long-term future. Packers President/CEO Mark Murphy, who recently said signing Thompson to a new contract was a priority, announced on Wednesday that Thompson has signed a new, multi-year contract with the team. Thompson is beginning his 10th season as the team’s football operations boss. Under his and Head Coach Mike McCarthy’s leadership, the Packers won a Super Bowl in the 2010 season and are currently on a three-year run as NFC North Division champions. “Mark Murphy and I have had ongoing conversations. I felt very appreciated by the organization and honored to work with such fine people. The more you think about it the more you wonder how nuts are you to walk away from something like this? After you put all of the chips on the table, there’s very little choice,” Thompson told reporters during his 1 p.m. press conference on Wednesday. Was his decision influenced by the Packers’ current run of success? “I think we have a chance to be a pretty good team if we play well, but the answer is no,” Thompson said. Extending Head Coach Mike McCarthy’s contract? “It’s a big priority. It’s always been the way it’s been done here; the general manager gets done (first),” Thompson said. 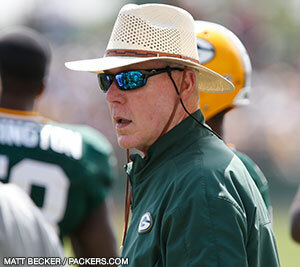 GREEN BAY–The long wait for the start of the draft is also wearing on the men who do the drafting. This year’s draft has been pushed back to May 8, two weeks later than usual. The additional scouting time hasn’t changed the Packers’ approach to the draft. “We feel like the draft is a long-term investment. We don’t get too involved in perceived needs. If you try to fill perceived needs, you mess up a couple of spots,” Thompson said. The Packers’ perceived need at safety? “You need good safety play to be a good defense. At the end of the day, you try to take the best player,” Thompson said. Several NFL GMs have referred to this draft class as the most talented in recent history. “I never try to evaluate a draft class. It usually takes three, four years to do that,” Thompson added. For the full report from Thompson’s press conference, click here.